With any conflict comes a risk to national infrastructure by terrorist organisations as a means to exert power and create panic and unrest among the population in the name of their cause. Long before the official start of Operation Banner in 1969, local Government and security forces (SF) were concerned about the security of key installations across Northern Ireland (NI) such as power stations, telephone exchanges, radio transmitters and reservoirs. In 1979 it was known from intelligence sources that it was a Provisional Irish Republican Army (PIRA) policy to attack targets in the field of transport and communications (National Archive CJ4/2852). 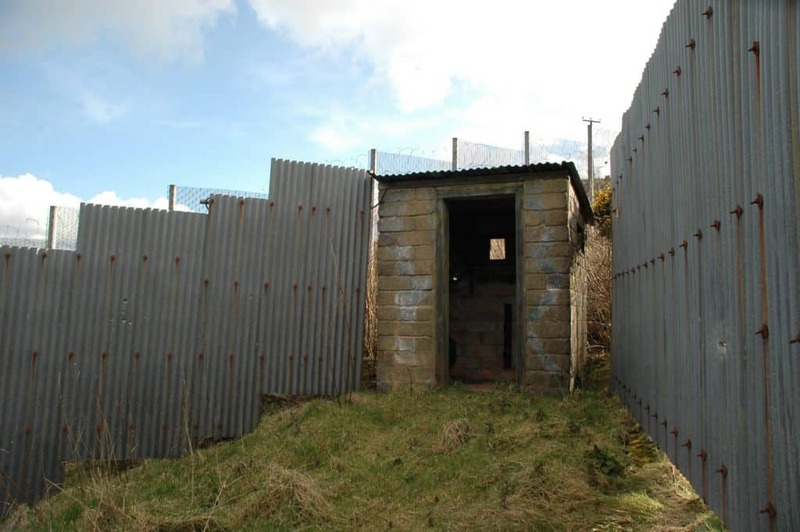 These sites were known as Key Points (KPs) and a civil Key Points Committee (KPC) was tasked with evaluating the risk to and advising on the protective measures for hundreds of these sites across NI. While the security forces were responsible for the protection of their own sites, there were circumstances where they also protected a number of these KPs. Public utilities serving large centres of population. A further definition is that of Vulnerable Point (VP), being any particular element within a KP that, if put out of action, would lead to serious disruption. Those KPs that helps significate economic value were detailed as Economic Key Points (EKPs). However, any physical security measure can be overcome with enough determination on behalf of the attacker, but usually at the sacrifice of time, noise or technical complexity. The main focus of protecting KPs was to deter and delay all but the most determined attempts, and in the case of unmanned sites, to alert the SF to any breach. By the end of 1981 there were 80 key points across NI that included water, electricity, communications and gas installations along with Aldergrove airport and industrial complexes. Of these 80, only nine had been allocated permanent guards; six at electricity installations, two at BT owned telecoms centres and one at the BBC transmitter at Divis. As far back as May 1957 it had been decided to provide a permanent police protection post at the Silent Valley Reservoir (PRONI, HA/32/1/1376). When it was established it was manned by a Sergeant and seven Special Constables, however in February 1958, such was the threat, that this had been increased to one Sergeant and fifteen Special Constables. The rather isolated post was equipped with a Marconi receiver/transmitter set, living quarters for the policemen, a generator for backup power, an Army 1-ton lorry and at least two Vespa Model 42L2 dual seat scooters. They also had responsibility for guarding the nearby Ben Crom reservoir that was also under construction 3 miles away. 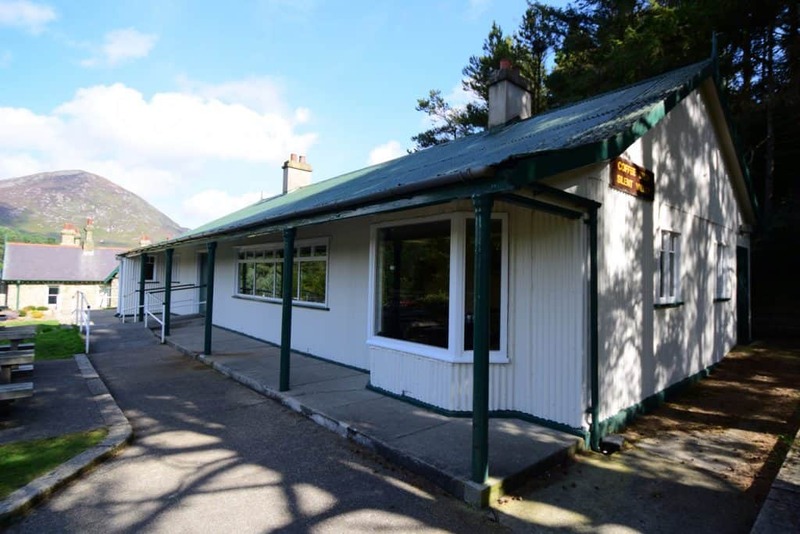 From descriptions, this is the most likely location of the police protection post in 1957 protecting Silent Valley and Ben Crom reservoirs in the Mourne Mountains, County Down. Photograph 2017, the author. The BBC site at Divis. Photograph 2008, the author. 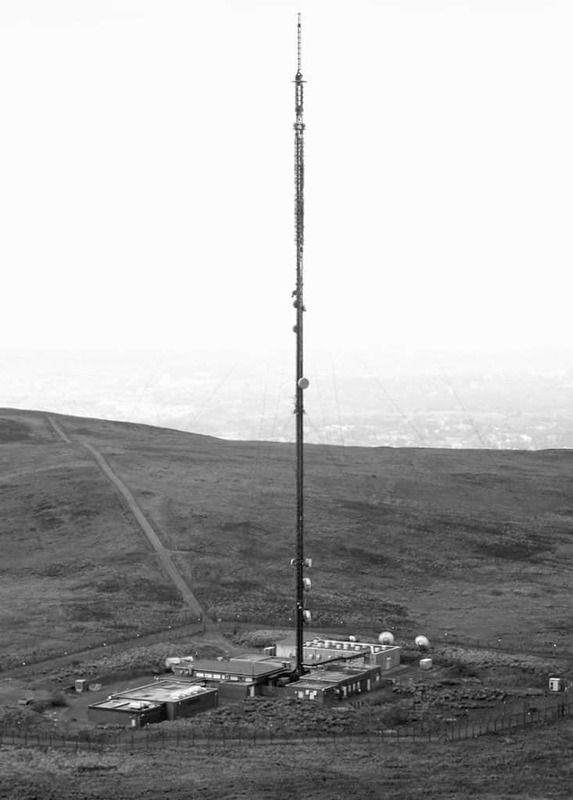 Key Point Green 2 (as it was once designated) the BBC transmitter on Divis Mountain occupied a site of 1.5 acres, 390m above sea level and was accessed by a 1.5 mile track from the public road. The Army provided a permanent guard consisting up to 8 soldiers at this site from 1973 until private security staff took over in 1982. The station was the main BBC radio and TV transmitter for NI and provided a vital link between RTE and mainland GB. It was a good example of KP protective measures having an impressive set of defences (as of 1983) – two outer fences, each 10ft high, barbed wire occupying the space between each which was also flood lit at night, CCTV covering the entrance, an air-lock system for entry into the compound, communications between the gate and the operations room, direct radio link with the RUC, all unnecessary windows bricked up and doors covered with steel sheet. While no credible threat had been received to the transmitter, the consequences of any disruption to operation could have been a loss of transmission for 2-3 days, restricted service for ups to 18 months. There would have been an adverse effect on the morale of the NI population, communications with GB would have been affected and local broadcasting companies would have suffered financial loss as a result of the downtime. With such a large and significant site sitting in a very exposed position, surrounded by bog, a long distance from the public road and one that was prone to low cloud and fog, it was important the site be protected. Kells sub-station. The image is from 2018, but some of the 1970s era protective measures can still be seen. 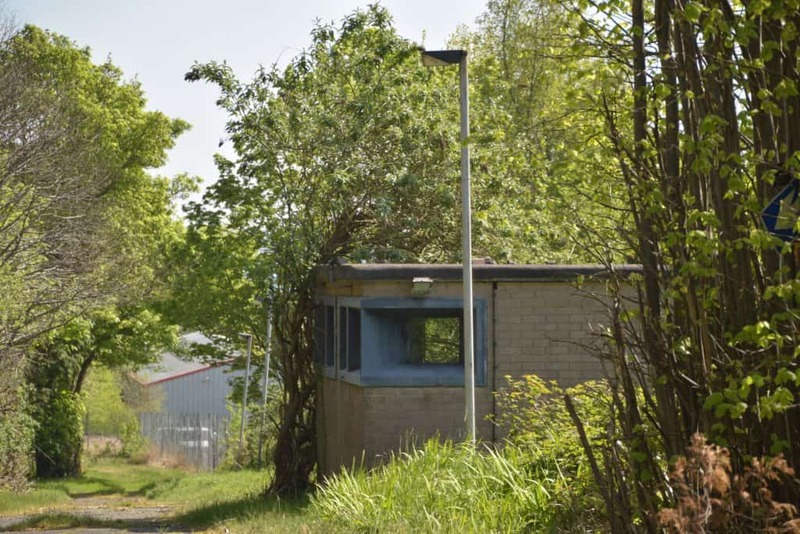 The electricity sub-station at Kells, 6.5 miles outside Ballymena was identified as a KP with a number of VPs and as such underwent a secret security review in 1978. 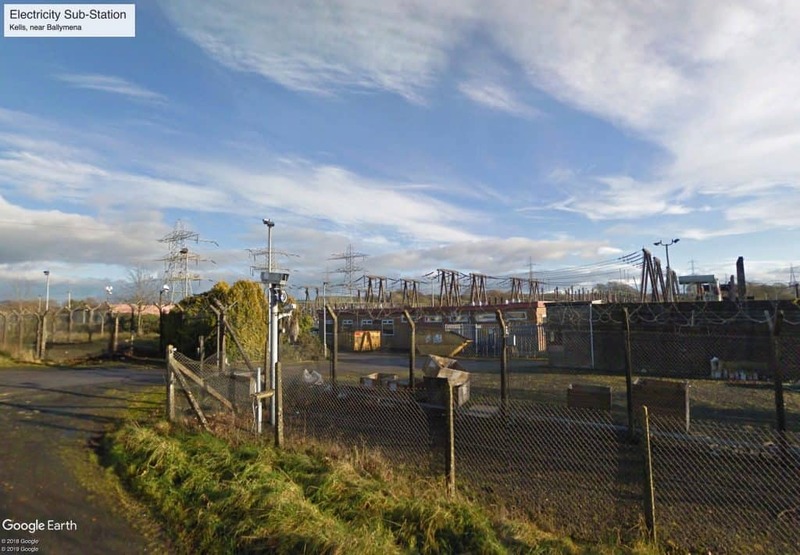 It distributed power to the north-east of NI and at the worst may take up to 2 years to repair in the instance of the relay room being destroyed. At the height of the Troubles, army static guards were sited here. Based on the recommendations of the KP review board (KPRB) a sterile area outside the perimeter was established, covered by CCTV and a perimeter intrusion detection system (PIDS) was provided – all of which can still be seen today. If you look at the base of the nearest CCTV mast you can see a short horizontal bar of a PIDS sensor. Like most telephone exchanges they were vital communication hubs that were vulnerable to terrorist attack. 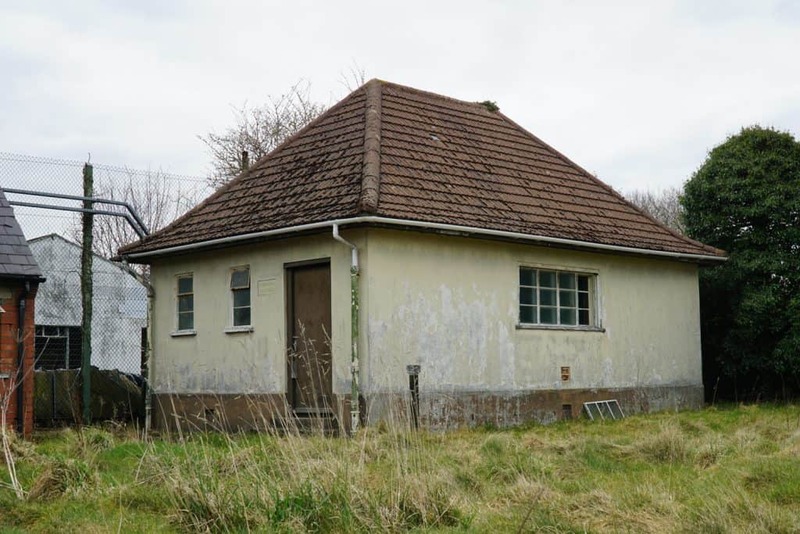 Bushmills telephone exchange was classified as a Green Target Installation (TI). It served a relatively modest 600 connections but also served the nearby air traffic navigation Consul station, meaning disruption may have a greater impact. The exchange was adjacent to Bushmills police station, and behind the perimeter wire, offering greater protection than most had. While permenant military presence at a Key Point was infrequent, the presence of a Target Installation in a local area called for greater scrutiny from the Security Forces. With frequent and irregular patrols in the area, they sought to reassure civilian staff and security personnel who were stationed at the site. They would also be able to check outer perimeters and conduct random checks of internal Vital Points, especially in the case of ungaurded KPs. The SF could also conduct Vehicle Check Points (VCPs) in the area and on approach to any KP to deter any would-be attackers. The shells of conventional buildings offer little protection against the determined attacker and are susceptible to breach after a few minutes. Methods of reinforcing windows and doors provide little additional delay, but if blocking them up is a viable option, then this will help slow an attack. For small unmanned buildings this is often an acceptable course of action to take. One such category of building for which this protection was appropriate was the unmanned radio transmitter site, often located on remote hilltops they would be left unattended, and depdndant on their function any hostile actions could have varying levels of disruption. The military transmitter site on Craigantlet Hills overlooking Belfast. This unmanned site has had all windows blocked up and sits within a double chain link fence compound topped with barbed wire. Security post at Kilroot power station, outside Carrickfergus. The same design of armoured post can be seen at police stations throughout NI. External 20ft high fence surrounding the perimeter. Not chain link but a newer weldmesh steel. This was topped with barbed (also known as dannert) wire. Behind the external fence was a further row of barbed wire at ground level. This was sandwiched between the outer fence and an electrified inner fence. A row of security lights illuminated the exterior of the site, dazzling any nightime attackers and illuminating the ground surrounding the site. All buildings identified as vulnerable points had their windows covered with steel shutters. Doors were also steel. Double fence comprising weldmesh steel exterior, barbed wire middle and an electric fence interior. All illuminated by floodlights. It would take a very determined attacker to breech this perimeter. More akin to a military installation an armed guardpost was constructed to protect the rear of the site. The conventional method of protecting a perimeter is by foot patrol, but this is easy to overcome. The 1970s saw the development of electronic surveillance systems which were prefereable for twenty four hour cover. An early development detailed in official documents was a system under review by the Home Office Scientific Advisory Branch (HOSAB) was being developed by Plessey. This was most likely the Plessey 3PS Perimeter Protection System. This system operates using a buried coaxial cable running a transmit and a receive circuit to detect disturbances in the radio field generated. It is unclear if this system became operational in NI following the HOSAB trials, but what does still remain is evidence of an alternative technology. 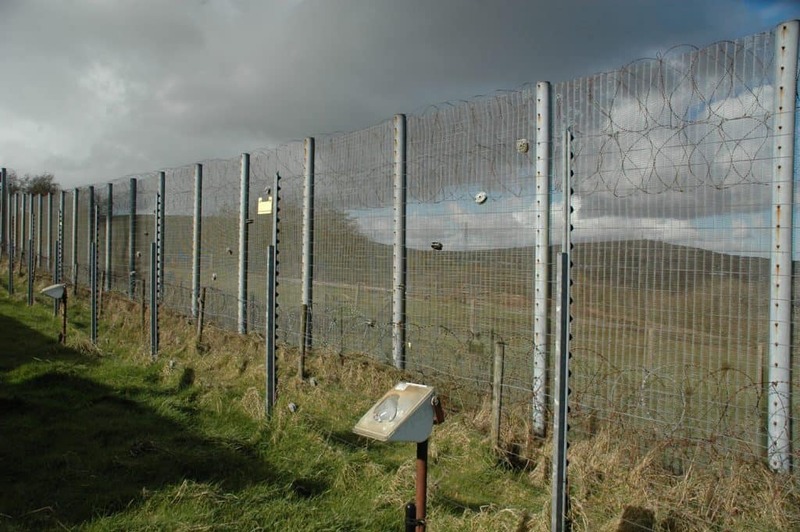 Known commonly as microwave fences, the above ground systems were most likely manufactured by Shorrock Security Systems. A chain of microwave transmitters and receivers were placed at intervals and operated either in a break beam mode or they could detect variations in beam strength upon the presence of an intruder. Perimeter Surveillance System most likely manufactured by Shorrock and installed on high value target installations. 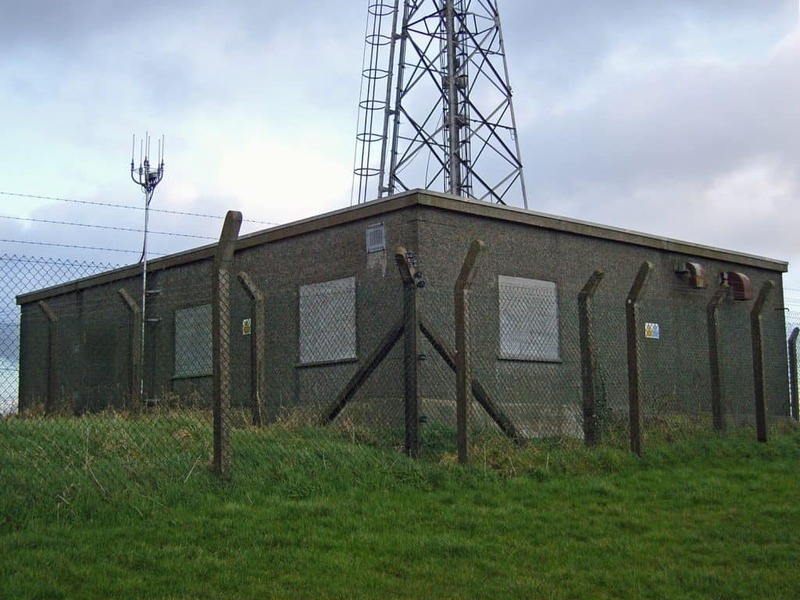 This example was in place at the ex-GCHQ Y-station at Gilnahirk. Another possible detector in use was the ground vibration sensor. 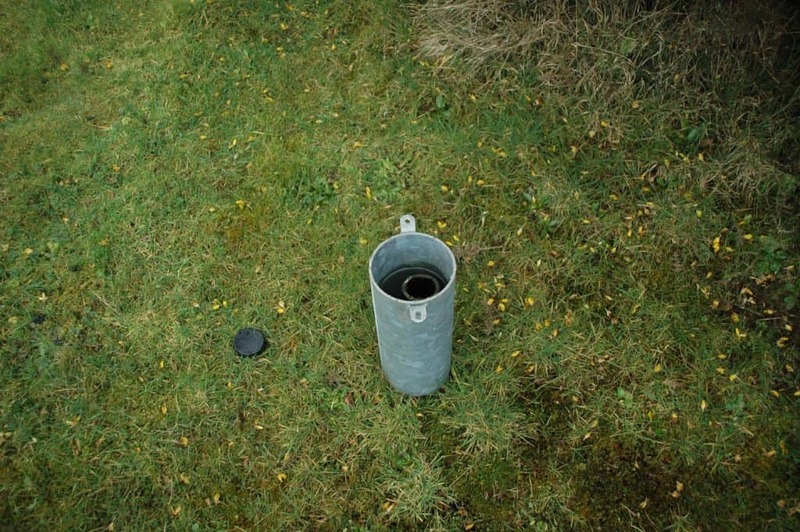 Installed around the Maze Prison were a series of steel cylinders sunk into the ground. Perhaps as a method for detecting vibrations in the event of a vehicle approaching across the perimeter. At this stage there is no evidence to support this. 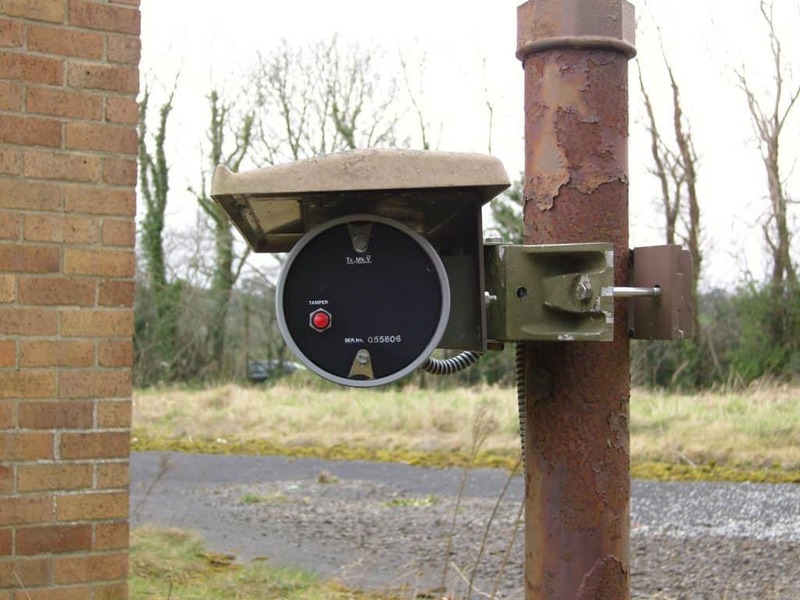 Possible ground vibration sensor at the Maze Prison. The designation and protection of Key Points was a priority for security forces in Northern Ireland during Operation Banner as the impact of any disruption to national infrastructure could have severe political, social or economic implications. The methods used to protect such sites ranged from secure fences to blocking windows and doors and in some cases placing a static civilian or military guard on the site. It is safe to say that even if you do not see protection, that it probably exists and all the technology mentioned in this article was introduced in the 1970s and 1980s – modern systems will be much more capable. If you look closely at some of the likely sites identified as Key Points you may find some legacy protective measures. Green 1 Radio Station, Ballygomartin P(G) Vital microwave terminal for telephony and TV. Green 2 Telephone House, Cromac Street, Belfast P(G) Telephony, TV, HF and Telex links. Handles emergency calls for Greater Belfast. Green 3 Telephone Exchange, Pasadena Gardens, Belfast P(NG) Includes connections to HQ RUC, Knock, Gilnahirk Radio Station and Dundondald House. Green 4 Telephone Exchange, Paulette Avenue, Belfast P(NG) Serves RUC HQ Belfast, Yellow 1, Yellow 3 and RUC Training Centre at Old Ropeworks. Green 7 Cable Station, Millisle Road, Donaghadee P(NG) Open terminal and test apparatus for undersea cables. Equipment very difficult to replace. Green 8 Telephone Exchange, Queens Quay, Londonderry P(NG) Connections including Ebrington Barracks, HF, VHF and PCM terminal. Handles emergency calls for North Londonderry. Green 9 Telephone Exchange, Kelvin Road, Omagh P(NG) Emergency calls in County Tyrone. HF, VHF and PCM terminal. Green 17 Telephone Exchange, Carrickblacker Road, Portadown P(NG) Emergency calls for North and Mid-Armagh. Main PO emergency centre. HF, VHF and PCM terminal. Green 18 Telephone Exchange, Downshire Road, Newry P(NG) Emergency calls for South Armagh and South Down. HF and VHF terminal. Green 19 Telephone Managers Office, Churchill House, Belfast P(NG) Area HQ for NI. Green 21 Ballymena Telephone Exchange, Troston Avenue P(NG) Emergency calls of Mid-Anrim. Main PO emergency centre. HF and VHF terminal. NI-GB standby Post Office terminal. 119 Radio Station, Cromkill VHF terminal providing standby terminal link to GB. 136 DeadmanÕs Hill Relay Station, Friary Road, Newtownards Micro-wave relay station with Standing Stones (144) relay station handles Belfast-Dublin and Dublin-GB traffic. 137 Clanrolla Decca Navigation Station Part of the North British chain providing navigation data for shipping and aircraft. 141 Repeater Station, Belfast Road, Donaghmore, Newry Co-axial repeater in Belfast-Dublin cable. 143 Radio Station, Shanes Hill Road, Ballymena Vital VHF repeater in Cromkill-GB telephony link. 144 Standing Stones Radio Station, Bundore, Hannahstown Microwave terminal Belfast-Dublin telephony and TV link. 145 Repeater Station, Knockmore, HullÕs Lane Co-axial repeater in Belfast-Dublin cable. 148 Repeater Station, Ardglass, Ballyhornan Terminal for submarine cable to GB.